SO MUCH YARN, SO LITTLE TIME! : New knits. 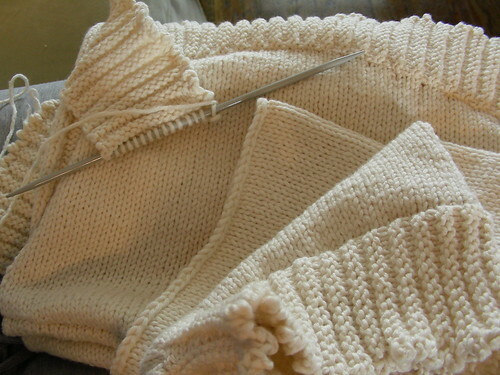 I have been seaming the border as I go...it doesn't feel like such a daunting task this way. I also cast on for another pair of socks for my DH. 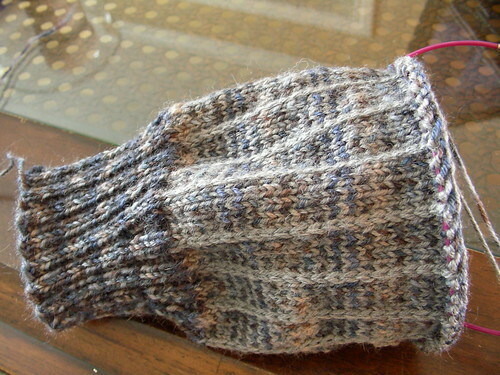 Karen of SWK let me in on her next knit...and yes I have been dreaming about it ever since. She is knitting the Pimlico Shrug by Tracey Ullman and Mel Clark using Koigu Kersti...oh can you just imagine?! I am so into shrugs lately and knew I had seen that pattern before..yeah I fav'd it four months ago! Now, I just need to open my own yarn store or win the lotto inorder to knit it out of Kersti! Yes I know you can sub in a cheaper yarn...but I am sure I will be set on Kersti when I see hers. You temptress you! No, really, she is a great shop keeper who knows her customers. *please excuse any typos or slurring of words...I had two doses of migraine pills in the last 18 hours. Gorgeous in-progress knits. I hope you feel better soon. Hope the migraine is better - as a sufferer - I know. Ugh. And, I am delurking. I just LOVE your blog and can't wait for the updates! Hello, I love your blog so far. I just had to comment about the migraines. I too suffer through them, I recently found that Bath and Body sells a homeopathic (sp?) oil for migraines, it works wonderfully! It doesn't fix it all on it's own but it's a close thing. Best $10 I ever spent.